Entrepreneurs and early-stage company participants get taken advantage of so frequently that we hardly notice. Bad equity deals are the rule, not the exception. 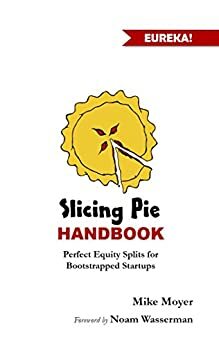 The Slicing Pie Handbook outlines a framework for perfectly fair equity splits for early-stage, bootstrapped startup companies. Based on the dynamic equity model popularized by the book Slicing Pie, a formula in use by entrepreneurs all over the world. 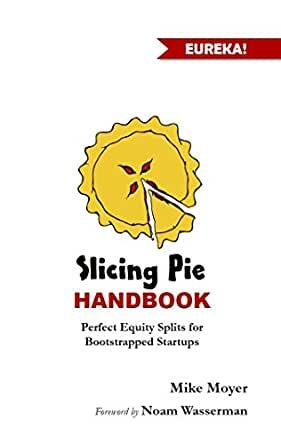 The Slicing Pie Handbook will help you determine the right share for people who contribute the things you need to start your company including help, equipment, supplies, rent and even credit. You will learn how to fairly allocate equity when people contribute and how to fairly recover equity when people leave the company. I've read the original slicing pie, but I like the handbook better. Besides some small updates that come from the author's increased experience of using the model, I think the terminology in this version is simpler and more consistent. I'll definitely be recommending the handbook to my cofounders instead of the original book. The author mentions an online tool, but isn't quite as transparent as I think he should be about pricing -- at the time of this writing, the pie slicer software is $10/month or $100/year. Although I think that's a reasonable price, it's easy to get the impression from the book that the pie slicer software is freely available to you. That is not the case (but there is a trial period). I've been implementing the model with just a couple of spreadsheets, so it's certainly easy enough without the specialized software, too. 5.0 out of 5 starsI wish I had this book 14 years ago! I found the original Slicing Pie after reading an introduction about the book and realizing that the partnership dispute scenario that I just went through is unfortunately all too common. Like many, my business partner and I split equity too early during the formation of the company. Things were great until my partner abandoned the company without cause and this left us in an unfortunate battle for how to move forward. I wanted to buy him out, but he demanded a ridiculous amount of money even though the business had almost no revenue yet. This put an immense amount of stress on the business. I fully employed Slicing Pie model in my latest (8th) business, and despite the typically life changes that sometimes happen between equity holders (one person had to leave for family issues, another couldn't contribute time after the initial push), there were zero issues or turmoil, because we had a fair agreement in place from the get go. Profit sharing distributions were even fairly made to those that had to leave early. I have been using Mike Moyer's Slicing Pie technique for a few years now and can attest to its effectiveness. It is a really efficient way to reward the grunts (hard workers in the startup), but also provide equity to the individuals who are not quite as engaged. I have yet to find a better technique out there! I liked this book even if I don't agree with all its ideas. It provokes deep thinking about the merits of the existing systems for equity division between founders. Anyone starting up something should read it (it doesn't take long). It will provide insight on the value of different contributions into your new venture but I would suggest at the same time questioning and critically thinking about the ideas proposed. Not all of them in my opinion can be taken on face value. Many start ups for example have a main person behind the idea. It is true that most ideas are cheap and come by the dozen, good ideas are rare, and in the end execution is everything. Still, that person would more likely than not be the driving force that makes it happen with their drive, ambition, personal investment, etc. That person's time and money are not the only consideration. Regardless, I highly recommend this book. This is an incredible book to read if you do not have cash for payroll but you have people who believe in your business model and are willing to bootstrap during the start-up stage. I am currently in a start-up stage and I have four people bootstrapping with me, and they all totally bought into Mike's book. Thanks!